For the Don DeLillo novel, see Falling Man (novel). For another use, see The Falling Soldier. The photograph gives the impression that the man is falling straight down; however, a series of photographs taken of his fall showed him to be tumbling through the air. The photograph initially appeared in newspapers around the world, including on page 7 of The New York Times on September 12, 2001. The photo’s caption read “A person falls headfirst after jumping from the north tower of the World Trade Center. It was a horrific sight that was repeated in the moments after the planes struck the towers.” It appeared only once in the Times because of criticism and anger against its use. Six years later, it appeared on page 1 of the New York Times Book Review on May 27, 2007. 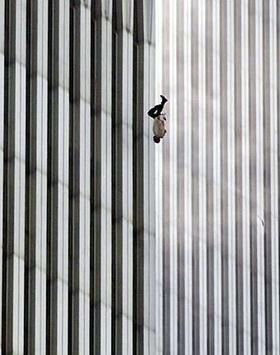 “The Falling Man” is the title of an article about the photograph by Tom Junod that was published in the September 2003 issue of Esquire magazine. The article was adapted as a documentary film by the same name. The article and film reveal the “Falling Man” may have been Jonathan Briley, who worked on the 106th floor of the north tower of the World Trade Center. If the falling man was indeed Jonathan Briley, he may have fallen accidentally from the restaurant on that floor while searching for fresh air and safety, or decided to jump. He was an asthmatic and would have known he was in danger when smoke began to pour into the restaurant. I hope we’re not trying to figure out who he is and more figure out who we are through watching that. The identity of the subject of the Falling Man has never been officially confirmed. The fact that so many people were trapped in the tower has made identifying the man in the 12 photos difficult. It is thought that at least 200 people fell to their deaths, though the actual number is not certain. The Globe and Mail reporter Peter Cheney suggested the man may have been Norberto Hernandez, based on his research, but, when Hernandez’ family closely examined the entire photo sequence, they did not feel that it was him. Michael Lomonaco, the chef at Windows on the World, suggested that the man was Jonathan Briley, a 43-year-old employee of the North Tower restaurant. Briley was initially identified by his brother, Timothy. Lomonaco was able to identify Briley by his clothes and his body type. In one of the pictures, the Falling Man’s shirt or white jacket was blown open and up, revealing an orange tee shirt similar to the shirt that Briley wore often. His older sister, Gwendolyn, originally helped in identifying the Falling Man. She told reporters of The Sunday Mirror, “When I first looked at the picture … and I saw it was a man—tall, slim—I said, ‘If I didn’t know any better, that could be Jonathan. '” Briley, a resident of Mount Vernon, New York, was a sound engineer, and his brother Alex is an original member of the 1970s disco group Village People. 9/11: The Falling Man is a 2006 documentary film about the picture and the story behind it. It was made by American filmmaker Henry Singer and filmed by Richard Numeroff, a New York-based director of photography. The film is loosely based on Junod’s Esquire story. It also drew its material from photographer Lyle Owerko‘s pictures of falling people. It debuted on March 16, 2006, on the British television network Channel 4. It later made its North American premiere on Canada‘s CBC Newsworld on September 6, 2006, and has been broadcast in over 30 countries. The U.S. premiere was September 10, 2007, on the Discovery Times Channel. The novel Falling Man, by Don DeLillo, is about the September 11 attacks. The Falling Man in the novel is a performance artist recreating the events of the photograph. DeLillo says he was unfamiliar with the title of the picture when he named his book. The artist straps himself into a harness and jumps from an elevated structure in a high visibility area (such as a highway overpass), hanging in the pose of the Falling Man. Richard Drew (born 1946) is an Associated Press photo-journalist, perhaps most notable for his photo The Falling Man which depicts a man falling from the World Trade Center towers following the September 11, 2001 attacks. A British documentary The Falling Man about the photo premiered on the Discovery Times channel on September 10, 2007. Drew was one of four press photographers present at the assassination of Robert F. Kennedy. Drew has been an Associated Press photographer for 40 years, and lives with his wife and two daughters in New York City.